Thank you for visiting Fore-edge Paintings, a site aimed to promote and celebrate books about, with and on the art of the fore-edge and their artists and binders. The banner image on this site is a replica of an actual fore-edge painting (one of the 25 actual paintings included in the deluxe edition copies of the Annotated Dictionary of Fore-edge Painting Artists & Binders. The Fore-edge Paintings of Miss C. B. Currie; with a Catalogue Raisonné by Jeff Weber and then reproduced in Portfolio of 25 Fore-edge Paintings by Jeff Weber). It illustrates an artist painting on the fore-edge of the clamped book, titled Five Dimensional Fore-edge Painting by artist Margaret (Allport) Costa. This site is created for Jeff Weber of Jeff Weber Rare Books by Ida (“Aida”) Rascol, Company Assistant. Aida was born in Eastern Europe and mainly grew up in Southern California. She attended UCLA for her undergraduate studies in the arts and SJSU for her Masters of Library Science. She has been with several museums and libraries before working, as of March 2012, with Jeff Weber Rare Books as Company Assistant (i.e., cataloging, book repair and restoration, image editing, web site work…). Her passions, though not limited to, are in the fine arts, dance, nature, and of course books. Born in Cambridge, Massachusetts, Jeff Weber grew up on Stanford University campus, attended UCLA (BA in Middle Eastern History) and Indiana University (Masters of Library Science). He worked with Jake Zeitlin at Zeitlin & Ver Brugge Booksellers, Los Angeles (1978–1987), and started Jeff Weber Rare Books in 1987, specializing in the history of science & medicine, and the history of the book & printing. Weber is recognized as the foremost authority on the history of fore-edge paintings as a result of collecting, study, lectures and articles. In 2006 he issued a monograph on the fore-edge paintings of English book collector, poet and artist John T. Beer, the first man known to regularly sign his fore-edge paintings. This book became the first complete study of a fore-edge artist, includes a catalogue raisonné, and traces the movement of every book Beer painted, placing many in private & public collections. In 2010 Jeff Weber published the most definative book on fore-edge paintings titled, Annotated Dictionary of Fore-edge Painting Artists & Binders. The Fore-edge Paintings of Miss C. B. Currie; with a Catalogue Raisonné. In addition: Click here to see his interview with ABAA. WEBER, Jeff. Annotated Dictionary of Fore-edge Painting Artists & Binders. The Fore-edge Paintings of Miss C. B. Currie; with a Catalogue Raisonné. Los Angeles: Weber Rare Books, 2010. Three parts in one book. 10 x 7 inches. approx. 432 pages. Illustrated throughout (most in color), indexes. Cloth, dust-jacket. LIMITED EDITION of 1,000 copies (975 trade copies and 25 deluxe copies specially bound and embellished with a hand-painted fore-edge scene on the fanned edge of the book). Note: deluxe copies are now sold-out but arrangements may be made for more with Jeff. Book printed and designed by Patrick Reagh, Printers. Signed by the author. THIS IS THE MOST IMPORTANT CONTRIBUTION TO FORE-EDGE PAINTING HISTORY IN OVER 40 YEARS. 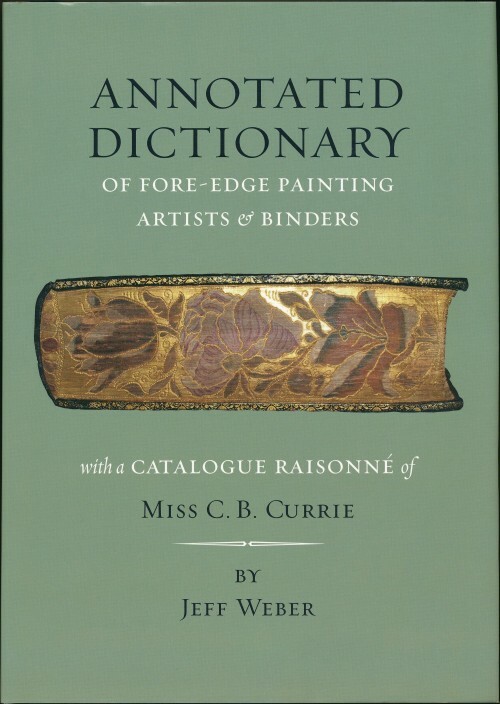 The first comprehensive annotated dictionary to contain the identification of all known fore-edge painters and binders. The book is sure to become the authoritative resource for fore-edge painting identification. The book is profusely illustrated with color reproductions. Containing three sections: firstly there is a series of short essays dealing with issues about fore-edge painting history. The second and main section will appeal to everyone with a fore-edge painting: a comprehensive annotated and illustrated dictionary of every artist and binder known to make and sign fore-edge paintings. This includes some additional binders and artists whose work can be grouped and identified, as well as including some binders who are suspect and possibly never made fore-edge paintings. An attempt is made to prove the work of every person and to give numerous examples. The book offers the most comprehensive assessment of seventeenth century English fore-edge specimens up to the present. The third section is a full history of the mysterious Ms. C. B. Currie, one of the most important fore-edge artists from England in the twentieth century and the only artist to have numbered her editions. The Currie project was challenging since no record of her entire fore-edge work exists and her identity had been unknown until recently.